This all in one printer is great for personal users and home office users alike, especially if you like to print photographs at home. Its price point makes it a great pick for casual users, whether you’re a family, student or working for your home office and its sleek enough to fit in in just about any environment. With high resolution prints and relatively quick printing speeds, you simply can’t do better at this price than the HP Envy 5544 e-All-in-One. This is a sleek, chic looking machine that won’t look out of place in your home, wherever you choose to keep it. It has a matte black finish and measures 16.1 x 45.4 x 41cm while weighing in at approximately 6.83kg. It has a 5.5cm touchscreen that is both easy to view and easy to use as well as a USB port. The HP Envy 5544 e-All-in-One also comes with a photo tray so you can quickly and easily print off all those smartphone pics you’ve been snapping. There are many advantages to the HP Envy 5544 e-All-in-One, one of which is its compact size, making it ideal for home use. Its Wi-Fi connectivity means you can print straight from your computer or smartphone and tablet without the use of wires. The printer has a print speed of 12ppm for black and white, and 8 pages per minute for colour prints, while print resolution is up to 1200 x 1200 rendered dpi with black and white, and up to 4800 x 1200 optimised dpi in colour. This printer can also be used with a variety of compatible ink cartridges, thereby helping to cut down on costs. 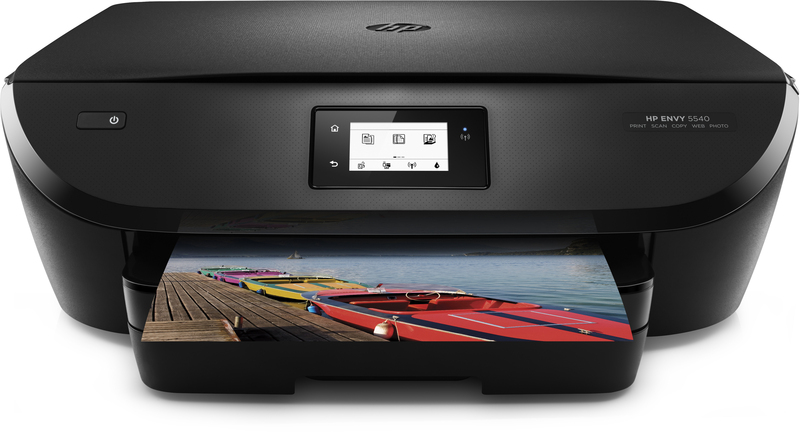 If you mainly print in monochrome then the HP Envy 5544 isn’t the machine for you, as the price per sheet will end much more expensive than with other printers.